This surgery is done using arthroscopic technique. Instead of a large incision Dr. Anderson use 3 small (about 1/2”) incisions. During an arthroscopy, a small camera, called an arthroscope, is inserted near the joint through a small (usually one-quarter inch) incision. The arthroscope is attached to a video monitor to allow Dr. Anderson to look inside your joint. She inserts special instruments that allow the removal of scar tissue, bone, and to perform the repair through the other two incisions. There are situations where an open incision is used due to the location or insertion of grafts, screws or other hardware. Since this type of surgery cannot be done with local anesthesia we use general anesthesia which allows us to work deep inside your shoulder or knee. Some patients also opt for a nerve block that allows the upper or lower extremity to become numb following the procedure. These blocks normally last 12-24 hours. Following surgery you will awaken in the recovery room with dressings on your knee or shoulder. Some patients will also be in an immobilizer or brace. There will be an ice pack to control the pain and swelling. You may also elect to have a cold therapy unit to be used following your surgery. Nothing can eliminate the pain completely but medication, sling/brace and the ice pack will control it so that you will be as comfortable as possible. The cold therapy unit cannot be placed directly on the skin or used continuously or it can cause a serious burn. How long will you stay in the hospital or surgery center? Most patients will have the surgery and go home the same day. This is called Outpatient surgery. There are a few cases where the patient needs to spend one or more night at the hospital. This will be arranged ahead of time and you will be informed if your procedure requires the hospital stay. Dr. Anderson normally performs the surgery at Pacific Heights Surgery Center and California Pacific Medical Center . Will I need to make ride arrangements at the time of my discharge? The hospital and surgery center requires that a friend or relative accompany you home from the hospital. You will not be discharged from the hospital or surgery center alone. Most patients are ready to leave two to four hours after their surgery. When do you return to the doctor’s office? Your first office visit is 1 week after surgery so that Dr. Anderson or the physician’s assistant can examine the surgical incision. She will give you additional instructions for exercises and discuss your allowed activity level. You will be given a prescription for pain medicine. Have this filled at your local pharmacy. Please take this as directed. That means that you may take the pills every 3-4 hours as needed. Take the medicine with food in your stomach. Taking the medicine on an empty study can cause nausea. You do not have to take the pills if simple rest, arm repositioning or the cold therapy/ice pack controls the pain. Since you (or your employer) have chosen an insurance carrier with particular benefits and because insurance coverage is a complicated business with no fixed rules, please check with your insurance carrier in regard to the specifics of your proposed surgery. Also note that the hospital bill is not something that our office can control, so please direct any questions regarding the specifics of the hospital, x-ray, laboratory and anesthesia bill to the hospital billing office. 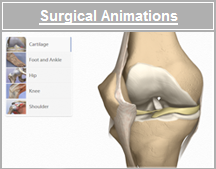 Although the operation involves your knee or shoulder, your entire body will react to the anesthesia and surgery. Your general medical condition is obviously important. If you are younger than 50 and in good health, routine laboratory tests are not necessary. You will need to see an anesthesiologist before going into surgery. If you have any medical problems, you will need to see a primary care doctor with whom we work with will or your regular doctor prior to surgery. Dr. Anderson feels this will provide you with the best medical care. Are there any Pre-Surgery Preparations? Shower with Dial soap daily for 3 days prior to surgery. Do not shave your legs within 48 hours of surgery. Keep the skin on your leg or shoulder clear of cuts, bites or open wounds. Any skin infection or cut near the incision area may be a reason to cancel the surgery. Call us or email a photo if you have any concerns about this. Nothing to eat or drink 8 hours prior to surgery as your stomach must be empty prior to anesthesia. Practice your post operative exercises for a few days before your operation. Make sure there's someone to take you home. Reread your pre and post operative surgery instructions the day before surgery. I am very nervous about surgery; do you have any resources that I can use to help with my anxiety? Many patients have found the benefit of guided imagery to help reduce anxiety, decrease pain and shorten their recovery. Studies show that patient who are calm and relaxed recovery more quickly from surgery. The Institute for Health & Healing, in cooperation with Surgical Services at California Pacific Medical Center, has provided a recorded relaxation and imagery session for download. Please click on the below link to download this MP3 file. What if I develop constipation following the surgery? We encourage you to return to the office for a further discussion at any time. You may contact our surgery scheduler, Jessica, at 415-923-3029 or email at jennifer@lakneedoc.com.